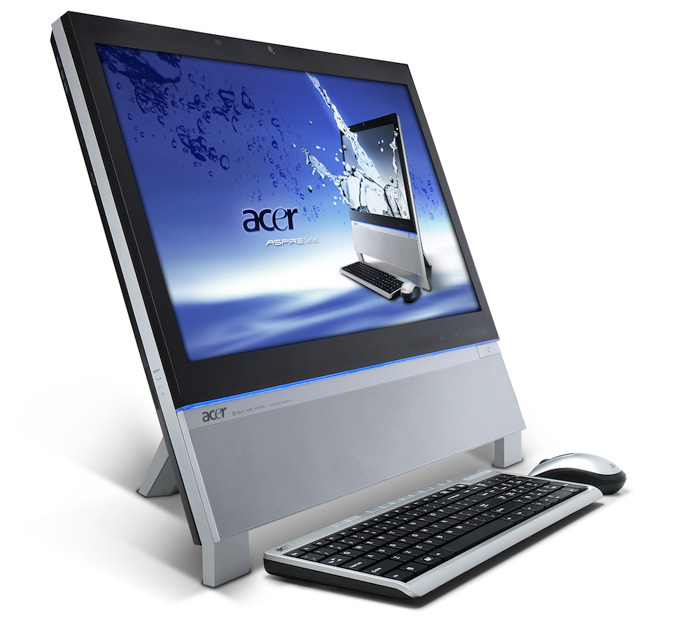 Here you are, another All-In-One solution for your home entertainment center, the Acer Aspire Z5763 PC which comes with 23-inch, 120Hz Full HD LCD display backed by NVIDIA 3D Vision technology and a pair of active shutter glasses, and also feature Acer AirControl technology which in combination with the integrated 2 megapixel web cam, allows you to control the media functions of the PC with gestures. The Aspire Z5763 features minimalist design with sharp-cut geometric lines and combination of aluminum with matt and glossy black surfaces. It comes with integrated emitter for the active shutter glasses and the 3D graphics is provided by GeForce GT 440 or GT 435M graphics card. The AIO can be equipped with Intel Core i5-2400s, i5-2500s or i7-2600s processors, supported by up to 16GB of RAM and up to a 2TB hard drive storage. There’s also Gigabit Ethernet, 802.11 b/g/n WiFi, Bluetooth 2.1, a multi-in-one card reader, built-in microphone and a total of eight USB ports for all of your peripherals. To enjoy 3D multimedia on the Aspire Z5763, the PC also has integrated two 5W stereo speakers, Blu-ray combo drive and optionally a TV tuner.Ti also supports Acer’s clear.fi media sharing system and comes with keyboard and mouse. The Aspire Z5763 will arrive in the UK from mid May starting at £999.